A cast aluminium frying pan is the perfect tool for delicate food like fish or egg dishes. The non-stick PermaDur coating is scratch-proof, resistant to food acids, and long lasting. 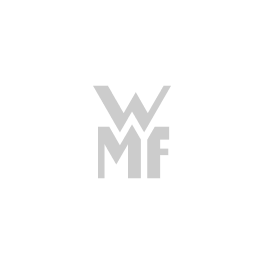 Covered by 5-year WMF guarantee. They don't need much fat, and when searing meat or chopped vegetables you can use spatulas on the hardwearing surface without a second thought. The pans are manufactured using the traditional forge casting process in Germany. The aluminium material ensures good heat conduction and retention. The frying pan is suitable for all kind of hob - including induction. Available in 3 sizes, flat and high, and as oven and grill pans. • Forge casting - made in Germany. • PermaDur non-stick coating - highly durable and long-lasting. • Suitable for all kinds of hob - including induction.